Enjoying his best performance since the start of this week-long adventure in Chile, Rockstar Energy Husqvarna Factory Racing’s Andrew Short has ended stage four of the Atacama Rally in ninth position climbing up to ninth in the provisional overall standings with one stage to go. 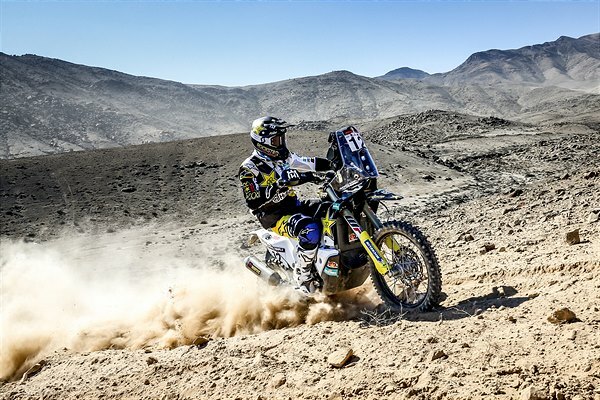 Battling through a challenging stage four, Pablo Quintanilla is currently third in the overall standings. A 371km tour to the north of Copiapó, the penultimate stage of this year’s Atacama Rally featured tricky navigation. Working hard since the start of this event to improve his speed and road book skills, Andrew Short demonstrated today he has been making steps toward the right direction. Putting in the ninth fastest time on the timed special, the American was less than nine minutes behind the day’s winner. Following his victory on stage three, Pablo Quintanilla was faced with the demanding task of opening the tracks for Friday’s penultimate stage of the rally. Enjoying an impressive pace for the majority of the timed special, the Chilean rally star suffered a small navigational mistake just 35km before the finish of the 253km long special. Crossing the line with the 12th best time for the day, Pablo is now third in the overall standings with one shorter stage still to be contested in the Chilean desert. Determined to give his all for the best possible result tomorrow, the FR 450 Rally powered rider has his eyes set on securing the maximum number of points on his way to defending his FIM Cross-Country Rallies World Championship title. A 205km loop around Copiapó, Saturday’s fifth and final stage of the Atacama Rally includes an 154km timed special. It will be the final chance for the Rockstar Energy Husqvarna Factory Racing riders to improve on their overall classification at this year’s event.